This is the time for the men to cook and organize a dinner to celebrate the women who have done so much hard work for our church to enjoy many successful meal gatherings including breakfasts, lunches and suppers over the year. If you are a woman, we invite you to come and be celebrated. If you are a man, join us for a delightful dinner. There will be plenty to eat even if you don’t bring anything. There will be turkey and ham and a host of accompanying vegetables, casseroles, desserts and more! 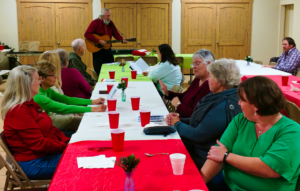 After dinner, Ralph Murphy will share some special music and a few Christmas Carols.